How does Flora pro-activ work? Cholesterol is a fatty substance that occurs naturally in the body and plays a vital role in keeping your cells working properly. However, too much cholesterol in your blood can affect your overall hearthealth and increase your risk of heart disease. Cholesterol is carried around the body by protein. The combination is called a lipoprotein. There are two main types of cholesterol: HDL and LDL. High-density lipoprotein (HDL) is good cholesterol for your heart health. It carries cholesterol away from your arteries and to the liver where it is eliminated. Low-density lipoprotein (LDL) is bad cholesterol for your heart health. It carries cholesterol from your liver to your body tissues. If there is too much LDL or ‘bad’ cholesterol in your body, it can build up in the cells and arteries. One of the main causes of high cholesterol is eating too much saturated fat. Fatty deposits (LDL) build up in your arteries which causes them to narrow. This puts strain on your heart and makes it more difficult for it to pump blood around your body, increasing your risk of coronary heart disease, which is the number one cause of death around the world. 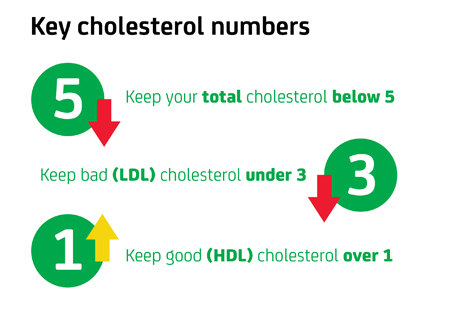 The good news is that you can manage cholesterol levels by making small changes to your diet and lifestyle. Knowing both your HDL and LDL cholesterol levels is the first step to a heart-healthy lifestyle. A simple blood test, which can be done by your GP, a practice nurse, or a pharmacist is all it takes to find out what they are. It is important that your LDL level is less than 3mmol/L. You should also aim for a total cholesterol level of less than 5mmol/L though your HDL level should be more than 1.2mmol/L. So keep your bad (LDL) cholesterol levels low and good (HDL) cholesterol levels high.